My Blissful Journey: New-To-Me Vegan Finds & Booch Results! New-To-Me Vegan Finds & Booch Results! Here is some of the finished product from the 1st batch of Kombucha that my Dad and I did. 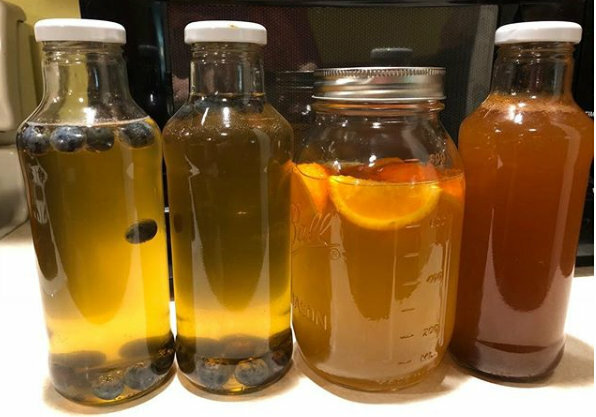 We just went with the 1st brew and flavored with slices of oranges in the middle one and whole blueberries on the two on the left. The one on the right is my Dad's experiment with ginger and cinnamon. The blueberry was ok...next time I think I will blend the blueberries and then add it to the booch. Altho I haven't finished the orange one (I have only sipped at little) I am totally LOVING the orange one! We had to pitch one of the smaller batches due to mold but the large 2 quart and a smaller mason jar worked well...we even grew 2 baby SCOBY'S! We started another small batch and in about a week and a half or so I want to try for the 2nd brew and carbonation! I waited for as long as I could but had to break down and go shopping the weekend before last. 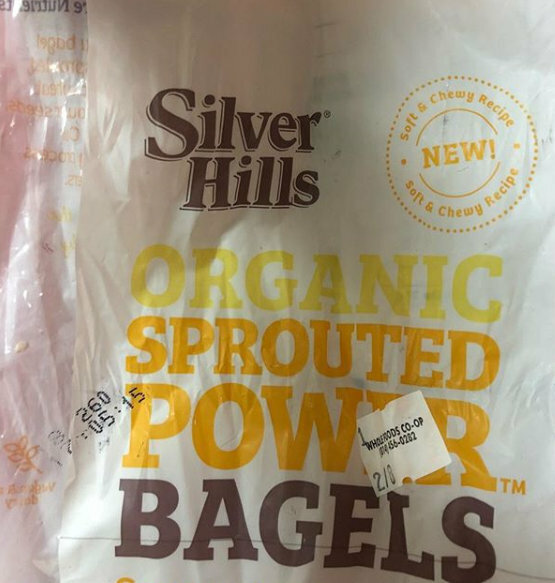 I stopped at Whole Foods Co-Op in Erie and they had a bunch of new products and a slew of sales...FIGURES...I didn't have a lot of money to go on a spree...but I did find some new-to-me items including these bagels! 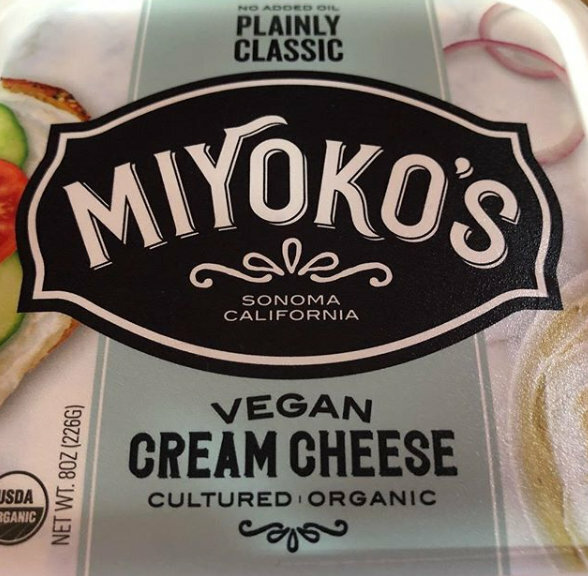 And Miyoko's! I think it was $2 off! I know I have had some of her other vegan cheese - like the pub cheeses - and flavored cream cheeses - but this might have been the first time I have tried the 'straight up' plain vegan cream cheese. And let me tell you...I LOVED IT! 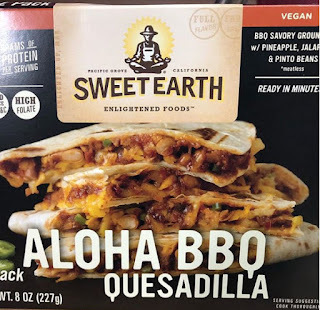 Target in Erie expanded their vegan offerings, too, including a pumped up Sweet Earth section! I already ate these Aloha BBQ Quesadillas. They were ok but I don't think I would buy them again unless they were on sale. They really didn't look anything like the photo. The vegan cheese was near non-existent, I couldn't really taste the pineapple either. They didn't taste bad but I I was thinking they would have layer upon layer of flavor but they really didn't. They are good if you are in a hurry, however. Another Sweet Earth meal I found was this. Again...if you can find them on sale they are worth a taste. With this I did appreciate that the cauliflower was actually roasted. It was literally a little bit of mac with cauliflower on top. There wasn't much vegan cheese sauce at all. Luckily I had some of my Vegan Alfredo left over from a previous meal that I added on top and mixed it. The flavor was good but it really could use more sauce! Check these 'bad boys' out! Daiya came out with some vegan yogurts. But not just ANY vegan yogurt...CRUMBLE Yogurts! As I type this I am eating the Key Lime one now and the taste is certainly a flavor EXPLOSION! 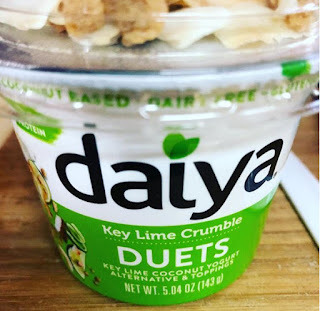 This Key Lime is right up there with the Lemon Cashewgurt for me - and that is saying a lot! I haven't tried this one yet but if it's anything like the Key Lime one I know I will be a fan! These are NICELY done. Word to the wise...be sure to stir these well! They are VERY thick! That in itself puts it in the WIN category for me because many of the vegan yogurts I have had up to this point have been runny and/or thin. And finally, Kite Hill Ricotta! It's the first time I have seen it locally and that was at my local Tops. However, it was EXTREMELY EXPENSIVE, but I felt like I had to buy some to support the addition of a new product at that store so I did. Of course, I really enjoyed it and can't wait to get more, so I hope they have it on sale VERY SOON! 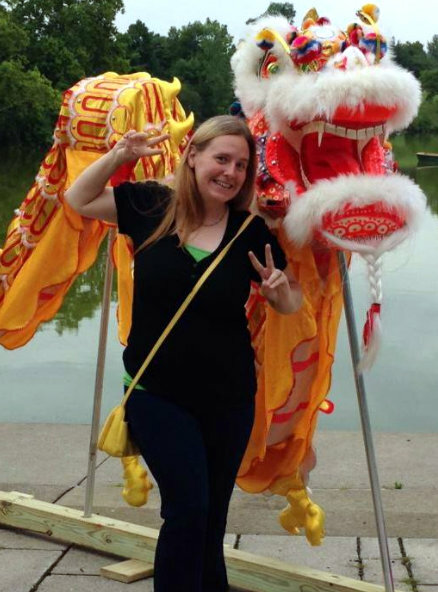 Congratulations on the booch! Blended blueberries sound amazing, and orange, yum!! Great finds! 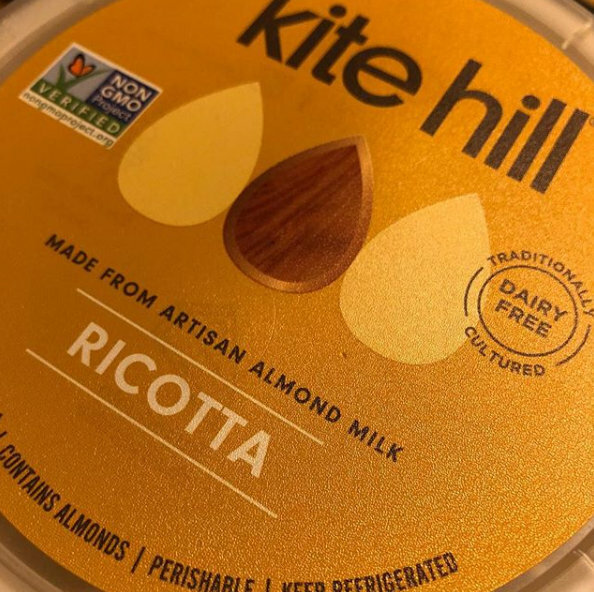 You're so right, the almond ricotta is so expensive. I always look at it longingly, but mose Kite Hill products are out of my budget.I'm glad it's tasty and worth it. So fun on the booch, I want to get into making my own again. And great eats, love that there are so many plant based dairy options now. I have another small batch just starting! I want to try the 2nd brew with that one! Try for that carbonation! Yay for the booch! That is awesome! The vegan finds look so good but I definitely have my eye on those yogurts! That sounds so fun and key lime sounds so so tasty. It WAS tasty! I loved the lime and tang! So good! YUM! 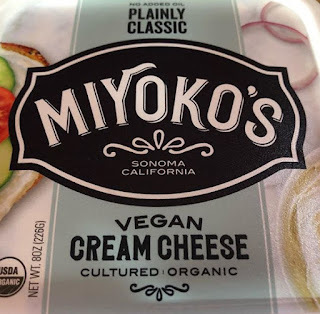 I think the only time I ate Miyoko's cream cheese was when it was 50%+ off at MOM's Organic. It was awesome! I wish there was a MOM's Organic closer to me! I've always fancied making my own kombucha - I'm so impressed at your booch-making handiwork! I'm not very good at it just yet but I can see how it would be addicting so I want to improve my skills! Thanks for the encouragement! Well THAT Booch didn't last long! I'll have to start rotating batches, I think! I can totally see how it would be addicting to see if you could 'outdo yourself' from the previous batch! Next time I want to master the 2nd Ferment to make it FIZZ! The quesadillas look good! My girl loves cauliflower Mac. 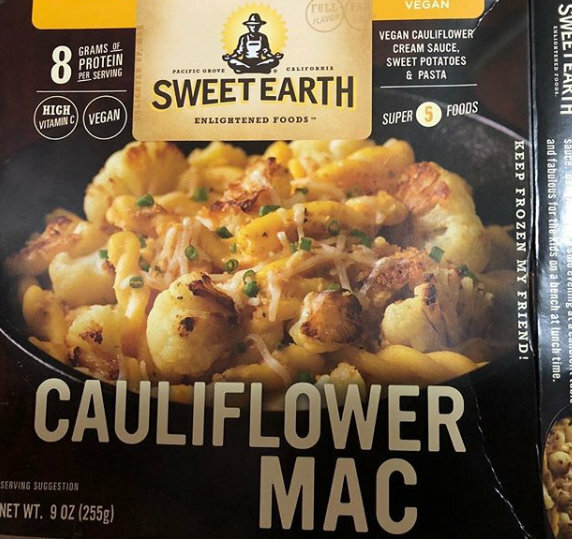 I'd love to see some of her Cauliflower Mac attempts! I am always super impressed by anyone making their own kombucha! Bummer about the ready meals. I hate when they don't put enough sauce or cheese in things. I watched others make it for YEARS and always wanted to! I was lucky enough a local family friend already started and had a SCOBY she gave me! Once you have that SCOBY you are SET!!!! 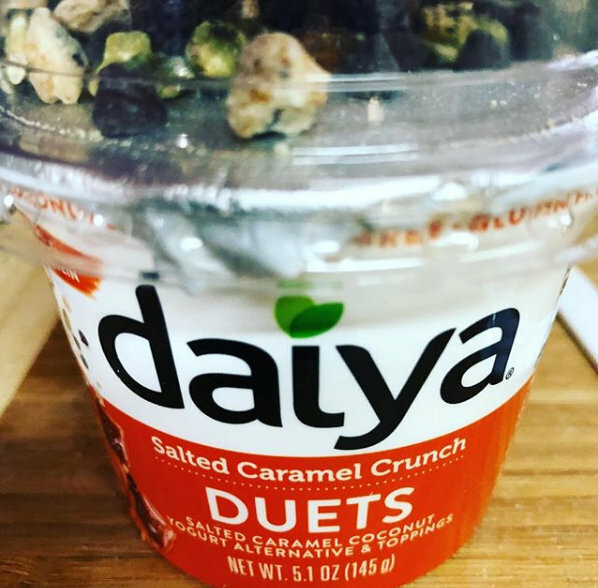 That's awesome that you're making your own kombucha, and the new Daiya yogurts sound fun! I'm curious what other ones I can find. I know I went back to the place I found these two and couldn't find them again!